Phurba (Tib. ཕུར་པ་, Wyl. phur pa/phur bu; Skt. 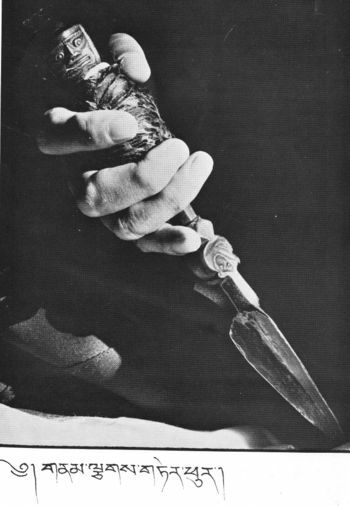 kīla/kīlaya) — a ritual dagger with a pointed three-edge blade, such as that held by the deity Vajrakilaya. According to the tradition of Vajrakilaya, there are four phurbas. ↑ Source: oral teaching by Dilgo Khyentse Rinpoche in Prapoutel; Khyentse Rinpoche is said to have based this list on a quote from Jamyang Khyentse Wangpo. ↑ Khenpo Namdrol (1999), page 45. Khenpo Namdrol, Vajrakilaya (Dharmakosha, 1997 or Snow Lion: 1999), pages 45-48. This page was last edited on 14 August 2018, at 09:15.